HLA-DRB5 belongs to the HLA class II beta chain paralogues. This class II molecule is a heterodimer consisting of an alpha (DRA) and a beta (DRB) chain, both anchored in the membrane. It plays a central role in the immune system by presenting peptides derived from extracellular proteins. Class II molecules are expressed in antigen presenting cells (APC: B lymphocytes, dendritic cells, macrophages). The beta chain is approximately 26-28 kDa and its gene contains 6 exons. Exon one encodes the leader peptide, exons 2 and 3 encode the two extracellular domains, exon 4 encodes the transmembrane domain and exon 5 encodes the cytoplasmic tail. Within the DR molecule the beta chain contains all the polymorphisms specifying the peptide binding specificities. Typing for these polymorphisms is routinely done for bone marrow and kidney transplantation. DRB1 is expressed at a level five times higher than its paralogues DRB3, DRB4 and DRB5. The presence of DRB5 is linked with allelic variants of DRB1, otherwise it is omitted. There are 4 related pseudogenes: DRB2, DRB6, DRB7, DRB8 and DRB9. Western Blot analysis of HLA-DRB5 expression in transfected 293T cell line (H00003127-T01) by HLA-DRB5 MaxPab polyclonal antibody.Lane 1: HLA-DRB5 transfected lysate(29.37 KDa).Lane 2: Non-transfected lysate. Western Blot analysis of HLA-DRB5 expression in transfected 293T cell line (H00003127-T02) by HLA-DRB5 MaxPab polyclonal antibody.Lane 1: HLA-DRB5 transfected lysate(29.26 KDa).Lane 2: Non-transfected lysate. HLA-DRB5 MaxPab rabbit polyclonal antibody. Western Blot analysis of HLA-DRB5 expression in human kidney. Western Blot analysis of HLA-DRB5 expression in transfected 293T cell line (H00003127-T03) by HLA-DRB5 MaxPab polyclonal antibody.Lane 1: HLA-DRB5 transfected lysate(30.10 KDa).Lane 2: Non-transfected lysate. HLA-DRB5 MaxPab rabbit polyclonal antibody. Western Blot analysis of HLA-DRB5 expression in HeLa. Immunoprecipitation of HLA-DRB5 transfected lysate using anti-HLA-DRB5 MaxPab rabbit polyclonal antibody and Protein A Magnetic Bead (U0007), and immunoblotted with HLA-DRB5 MaxPab mouse polyclonal antibody (B02) (H00003127-B02). 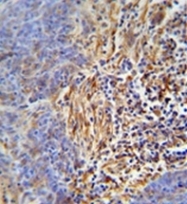 Immunohistochemistry analysis in formalin fixed and paraffin embedded human lung carcinoma reacted with HLA-DRB5 Antibody (Center) Cat.-No AP52055PU-N, which was peroxidase conjugated to the secondary antibody and followed by DAB staining. Western blot analysis of HLA-DRB5 Antibody (Center) Cat.-No AP52055PU-N in HL-60 cell line lysates (35ug/lane). HLA-DRB5 (arrow) was detected using the purified Pab.